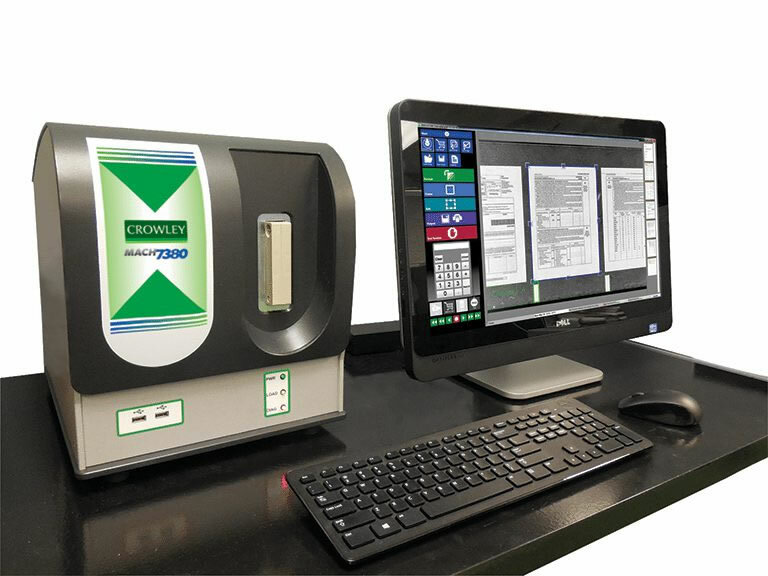 The Crowley MACH 7380 HDX Microfilm Reference Archive Scanner reverses the inefficient aspects of traditional microfilm retrieval by offering real-time on-screen image views, multiple output / delivery options and work saving, user friendly functionality. The MACH 7380 HDX microfilm scanner is designed to elevate retrieval systems into the modern era with fast-paced technology, low-maintenance costs, and less consumable parts when compared with aging microfilm scanners / blip film scanners. A microfilm reference archive provides trustworthy copies of records to validate transactions, satisfy litigation or meet regulatory and audit requirements. With the MACH 7380 HDX microfilm scanner that fits on your desktop, images from reference microfilm (also known as image marker or blip microfilm) are retrieved quickly and displayed digitally for identification. Output options include printing, e-mailing or saving to USB or network. The MACH 7380 HDX reference archive scanner produces exceptionally high-quality images that are deskewed, cropped, merged (duplexed) and displayed in seconds. With the MACH 7380 HDX microfilm scanner, you can blend microfilm’s proven stability with the efficiency of digital technology – the best of both worlds. Download the complete Crowley MACH 7380 HDX Microfilm Reference Archive Scanner Specifications here.